The endless number of historic, scenic, unique, and simply beautiful sights to be seen across New York State are enhanced by the accompaniment of a tour. To learn more about the beauty that surrounds you, from natural wonders to manmade marvels, check out these 10 impressive sightseeing tours. Get up close and personal with Niagara Falls on the Maid of the Mist, a boat that’s been taking sightseers into the mist for generations. Ponchos are provided—you’re going to get soaked! Built in 1969 as a passenger steamboat, the Minne Ha Ha still runs on Lake George today. Hop aboard the gorgeous, iconic boat and take in the natural sights around the lake. 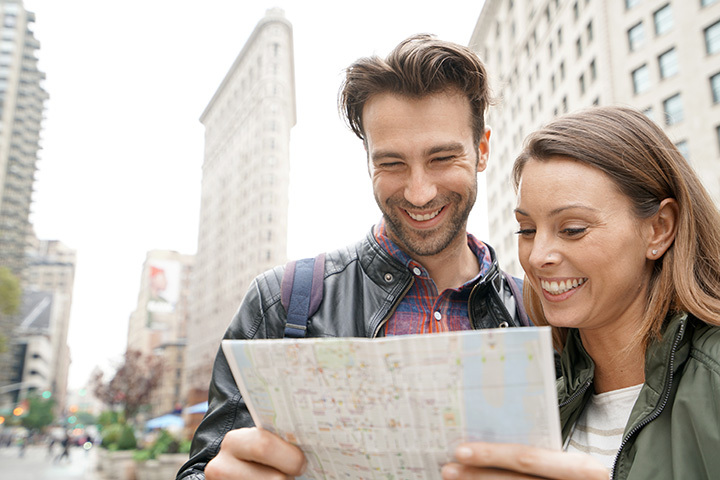 The Dozen Apples tour is one of the best ways to maximize your sightseeing in New York City. The six-plus hour tour guides visitors to 12 famous hotspots via walking and public transportation. The Adirondacks region has an answer to New York City’s High Line, and it’s wild. Walk just above the tree line on The Wild Walk while observing the majestic mountain scenery and learning about the local ecosystem. Offering tours by double decker bus, boat, bike, or helicopter, Go New York Tours will get you to all the major sights in the Big Apple, by whichever mode of transportation you choose. Cruise through the Thousand Islands region with Clayton Island Tours. There are two great options: a glass-bottom boat for underwater sightseeing, and a boat that drops you off to explore the gorgeous Heart Island. Want to see the places where your favorite TV and movie characters hang out in the city? On Location Tours makes it happen, with guided trips to iconic settings from the big screen and the small screen. See the perimeter of Manhattan by boat—Circle Line Sightseeing Cruises has been facilitating that since 1945. Tour boats circle around the island, showcasing parts of every borough and the Statue of Liberty. Take a boat ride through a six-million-year-old underground cave, then walk around its impressive caverns. Sightseeing ranges from family-friendly excursions and eerie lantern tours to romantic date nights for two. They say that “Ithaca is gorges.” Find out for yourself on one of Experience! Finger Lakes’ three epic waterfall and gorge tours, which last from one to two hours and include driving, hiking, picnicking, and some stunning natural views.